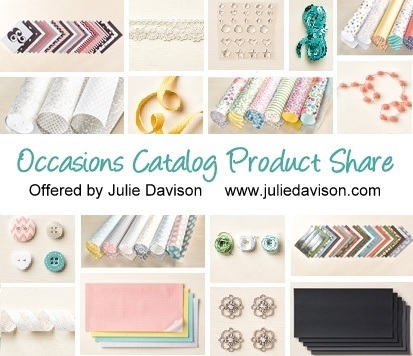 Since I bought it all myself, I can tell you that the new paper and ribbon and embellishments in the Occasions Catalog are so much more gorgeous in person than they appear in the catalog! See for your yourself! Sign up for my product share and try a little bit of everything for only $29.95 + $4.95 S/H. When each product share is full, I will send you a Paypal invoice for the product share ($29.95 + $4.95 s/h) and order the product.